Marriage records are one of the most valuable sources of information—because they’re one of the few records that give the maiden name of the wife. They’re also valuable because churches and governments often kept marriage records before they documented other life events. Whether a civil or church authority performed the ceremony, local laws usually required that the marriage be recorded in civil records. Marriage has always been a public covenant, recorded in a variety of ways, including banns, bonds, licenses, newspaper announcements, and church and civil records, which may state a couple’s intent to marry or provide a record of the actual marriage. These records are usually stored with the clerk of the town or county where the bride resided, but some particularly early ones may be housed in the state’s archives and more recent ones may be found in the state’s Division of Vital Records. 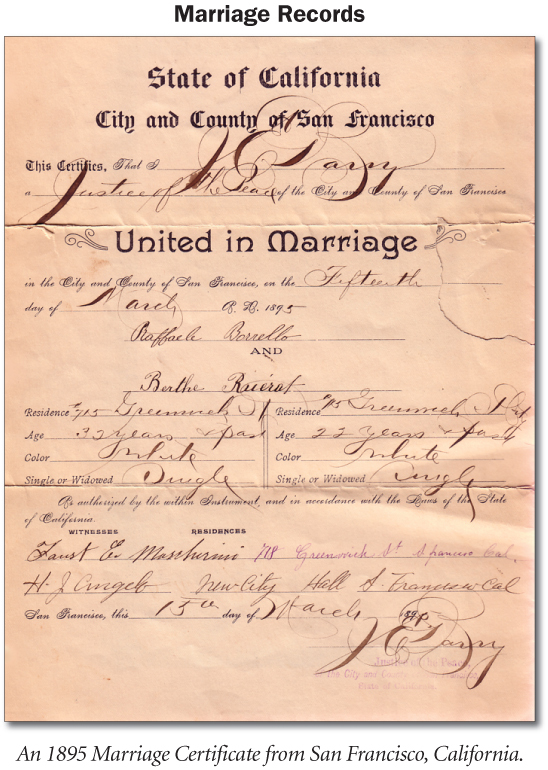 1) Family History Library — has copies of many marriage records (primarily those before 1920) and many statewide indexes. Check the FHL Catalog for the State, County or Town where the marriage took place. 3) Counties or Towns — these jurisdictions usually kept records before the states did. Go to this site for information on where to send (and the cost) for the locality where the marriage took place: http://www.vitalrec.com Also, see pages 9.10-11 for info on how to find county records. 4) Internet — some marriage indexes/records are online. Go to http://www.cyndislist.com and check your state. • If you don’t find a record from any of the above, check FamilySearch for a Resource Guide for the locality you’re interested in for other possibilities.